ANDOVER cueman John Hunter ended a marathon 11-hour day by extending his lead at the top of the Cuestars Seniors (40+) Tour rankings. 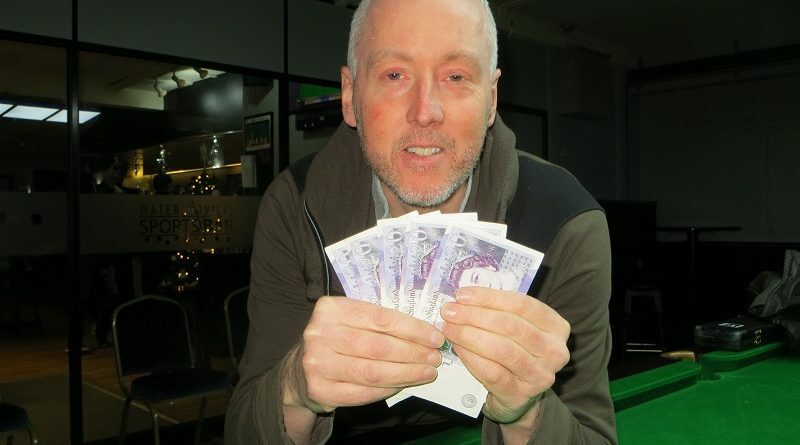 The 52-year-old emerged victorious from Waterlooville Sports Bar with £100 prize money in his pocket after beating Martin Wallace 2-0 in the final of the fourth leg. Hunter, who also claimed the second leg in Fareham, won the opening frame on the brown and broke the back of the next by smacking in a long red down the rail to commence a run of 35. Although clearly frustrated at times not to be scoring really heavily during a mentally and physically draining day, Hunter insisted he was happy with his overall performance. “It was a very long day,” he said. “The tables are so good so when you can’t get in to score it’s really frustrating. “I had to show patience, that’s not to say I didn’t get a bit wound up on occasions. But I thought just wait and the chances will come. And luckily they did. Meanwhile, hats off to Phil Morgan (Salisbury) for reaching his first semi-final at his 14th attempt. The 56-year-old Masters (55+) rankings leader beat World Seniors Tour player Neil Craycraft (Didcot), who had won two of the three previous events that he had entered, en route to topping his six-man group and overcame Paul Burt (Salisbury) 2-1 from 1-0 down in the last-eight. Morgan then had a 20-point lead with the remaining five reds on cushions in the deciding frame of his last-four match against Wallace and lost when his opponent from Wokingham fluked the match-ball blue from a snookered position. And more hats off to Burt who had qualified for his first knockout in nearly eight years by edging tennis coach John Monckton (Woking) 2-1 in his last group-stage match. Hunter has a 29-point lead over Wallace following the event sponsored by Fawley-based Kara Accountants. Davies is three points further back in third. The 23-strong field returned 22 breaks of 40 or more. Wallace produced a 62 clearance to wrap up a 2-0 quarter-final victory over James Height (Shepton Mallet), who had recorded the day’s highest break of 73 in his group-stage win over Carl Davies (Bournemouth). Chris Rigby (Sutton) climbed to joint tenth after his 2-1 semi-final defeat by Hunter. Jesters Snooker Club, Swindon, hosts the fifth leg of eight on Sunday, January 27. For more information about Kara Accountants, visit www.kara-accountants.net. John Hunter: 65, 62, 55, 43, 42. Neil Craycraft: 50, 49, 43. GROUP A: 1st, John Hunter (Salisbury SC); 2nd, Paul Burt (Salisbury SC); 3rd, John Monckton (Woking SC); 4th, Dan Hammond (Chandlers Ford SC); 5th, Paul Lawrence (Park Gate RBL). GROUP B: 1st, James Height (Break N Dish, Street); 2nd, Neil Herd (Salisbury SC); 3rd, Mike Quinnell (Old Bexley Ex-Servicemen’s Club); 4th, Carl Davies (St James Inst, Bournemouth); 5th, Neil Carroll (Chandlers Ford SC); 6th, Nick Miles (Cue T’s, Marchwood). GROUP C: 1st, Phil Morgan (Chandlers Ford SC); 2nd, Neil Craycraft (Jesters, Swindon); 3rd, Lawrence Millington (St James Inst, Bournemouth); 4th, Dean Sycamore (Chichester City Club); 5th, Andrew Darken (Chertsey SSNR Club); 6th, Darren Johnson (Petersfield Bowls & Snooker Club). GROUP D: 1st, Chris Rigby (Chertsey SSNR Club); 2nd, Martin Wallace (Crucible, Newbury); 3rd, Steve Ashton (Salisbury SC); 4th, Stephen Hills (Traders, Northfleet); 5th, Herman Desmier (Bournemouth & District Constitutional Club); 6th, James Trump (SWSA, Gloucester). QUARTER-FINALS (12 pts): Hunter 2-0 Craycraft, Rigby 2-1 Herd, Wallace 2-0 Height, Morgan 2-1 Burt. SEMI-FINALS (15 pts, £35): Hunter 2-1 Rigby, Wallace 2-1 Morgan. FINAL (25/18 pts, £100/£60): Hunter 2-0 Wallace.